I’ve always loved early music. I’m a cradle Episcopalian; my father is a priest and my mother is a church musician, so when I say that I can’t remember a time before I knew about Bach and Handel, I mean that literally. Our hymnal is liberally sprinkled with settings written by early composers, from Schütz and Praetorius through Purcell and, of course, Bach and Handel. When I studied both flute and piano as a child, I was always enchanted by the sound and feeling of Baroque music—by the gestured nature of it all—and so I think it was probablyinevitable that I would love playing Baroque flute and recorder when the opportunities to learn presented themselves. I studied Baroque flute in both my undergraduate and masters programs, adding alto recorder during my years at Florida State University, where it is still a requirement that all flute graduate students learn to play both Baroque flute and recorder. I took to it and continued study past theclasses by joining the FSU Baroque Ensemble. During the four years of my doctorate, however,I played Baroque flute exactly once. There simply weren’t opportunities for early music past theRenaissance ensemble at that school, and I had concerned myself much more with playing inthe orchestra and graduate quintet, and with learning 20th century repertoire. (Forgive me—I graduated in 2004, so there wasn’t much 21st century repertoire yet!) I felt fairly certain that I knew the path my career would take, and it would involve more multiphonics than inégal. Fast forward a few years, and you would have found me filling in for an old FSU friend as a sabbatical replacement at a Texas university, where she had begun an Early Music Ensemble. 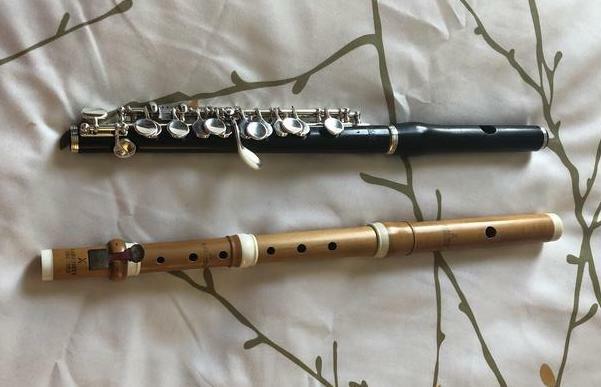 Ihad to pull my Baroque flute and recorder back out in a hurry! I fell in love with it all over again that year and resolved to keep playing and keep my skills close at hand. When the year in Texas ended and I returned to Nashville, I found that in my absence, a professional Baroque ensemble had formed, and they needed a flutist. It was my lucky day! I’ve included all this background so that you’ll understand that I am an accidental early music devotee, in a way. I dearly love all the time I’ve spent playing Baroque music, which is rich and deep in its complexity, and I love even more the way I have begun to understand the language of the era, musically speaking. But because of my lack of serious private study, perhaps, because I didn’t come through one of the historical flute programs at IU or in Boston, I literally had no idea that Baroque piccolo was a thing! The first time the need for a one-keyed piccolo popped up in my life, Music City Baroque (then called Belle Meade Baroque) was hosting Baroque violinist Robert Mealy as our guest director in a concert of French music. This was my first exposure to Rameau and to the sort of ornamentation that is required in French music of the era, and I loved every moment of it, although I was pretty seriously overwhelmed. When Robert asked me if I had a piccolo, I think I sort of blinked at him and shook my head. Music City Baroque continued to expand our operation and repertoire, and pretty soon, the Baroque piccolo question was coming up a couple of times a season. When I traveled to play some more Rameau, I borrowed a one-keyed piccolo from a very understanding friend, and finally, last year, I bought my own. They’re fairly rare; there really is no Flute World for Baroque flute players in the US, although there are some very good options for purchasing instruments. I happened to call Von Huene Workshop in Boston at a time when they had a Baroque piccolo in stock, at the right price, and perfect for my needs. I haven’t regretted the purchase one bit! Playing the Baroque piccolo can be tricky. The embouchure hole in the headjoint joint is tiny and requires the player to form an equally tiny aperture. At first, I also found I had a hard time learning to cover the holes, which are very small and very close together, but with time and practice, that part is no problem. Concerning pitch, I find it to be no more difficult to play Baroque piccolo than it is to play Baroque flute, but don’t be fooled by that statement—it’s plenty hard to learn to play Baroque flute in tune! Since pitch adjustments go hand in hand with learning to play the one-keyed flute, assuming a player learns that instrument first, the same practices hold for piccolo. Regarding the instruments in my personal collection, my piccolo is actually a bit easier to control than my flutes are. My Baroque piccolo is a von Huene copy of a Rottenburgh original, in boxwood. I have also played an unknown (to me) copy by Catherine Folkers, made of ebony or grenadilla. 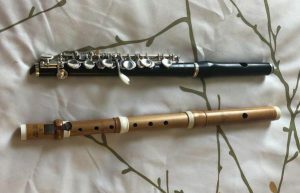 These two instruments are as different from each other as they could be; the Folkers has a sweet, gentle sound to it, reedy and dark, while my von Huene is more strident and brassier. As with all piccolo playing, I find it best to just get down to business when playing. Timidity often results in a failure of sound production; better to opt for bravery and then strive for dynamics and subtlety and color changes without trying to hide. Probably my Baroque piccolo is the most niche of all my niche instruments (we’re looking at you, sopranino recorder…), but when you need one, nothing else can substitute. In the spots where composers indicated that it should be played, it adds just what you’d think it would—more color, more range, more racket!